La micosis fungoides rara vez se describe en la niñez, aunque es el tipo más frecuente de linfoma cutáneo de células T en esta edad, en la que predomina el inmunofenotipo CD8+. Se manifiesta con parches hipopigmentados, por lo que se debe hacer diagnóstico diferencial con otras lesiones hipopigmentadas, como vitiligo, pitiriasis versicolor y lepra, entre otras. En niños es más común que se presente clínicamente en los estadios iniciales de mancha o placa, lo que hace que su pronóstico sea bueno. Las terapias más utilizadas para el tratamiento en niños son los corticosteroides tópicos de alta potencia y la fotoquimioterapia PUVA. Médica dermatóloga, Dr. Sc. en Inmunología; Grupo de Investigación Dermatológica, GRID; profesora, Sección de Dermatología, Departamento de Medicina Interna, Facultad de Medicina, Universidad de Antioquia, Medellín, Colombia. 1. Criscione V, Weinstock M. Incidence of cutaneous T cell lymphoma in the United States, 1973-2002. Arch Dermatol. 2007;143:854-9. 2. Pabsh H, Rutten A, Stemm A, Meigel W, Sander CA, Schaller J. Treatment of childhood mycosis fungoides with topical PUVA. J Am Acad Dermatol. 2002;47:557-61. 3. Barona MI. Linfoma cutáneo. En: Vélez H, Borrero J, Restrepo J, Rojas W, Falabella R, Chaparro J, et al., editores. Dermatología. Medellín: Corporación para Investigaciones Biológicas; 2009. p. 399-405. 4. Chaves M, Sánchez J, Santos J, Alonso M, Bordel M, González C. Micosis fungoide hipocrómica en la infancia. Med Cut Iber Lat Am. 2007;35:306-9. 5. Vassallo C, Brazzelli V, Cestone E, Castello M, Ciocca O, Borroni RG, et al. Mycosis fungoides in childhood: description and study of two siblings. Acta Derm Venereol. 2007;87:529-32. 6. Willemze R. En: Horn TD, Mascaró JM, Saurat JH, Mancini AJ, Salasche SJ, Stingl G, editores. Linfoma T cutáneo. Dermatología. Primera edición. Madrid: Elsevier; 2008. p. 1921-48. 7. Hess Schmid M, Dummer R, Kempf W, Hilty N, Burg G. Mycosis fungoides with mucinosis follicularis in childhood. Dermatology. 1999;198:284-7. 8. Morales MM, Olsen J, Johansen P, Kaerlev L, Guénel P, Arveux P, et al. Viral infection, atopy and mycosis fungoides: a European multicenter case-control study. Eur J Cancer. 2003;39:511-6. 9. Varela MM, Olsen J, Johansen P, Kaerlev L, Guénel P, Arveux P, et al. Occupational risk factors for mycosis fungoides: a European multicenter case-control study. J Occup Environ Med. 2004;46:205-11. 10. Sylvie E, Kanitakis J, Claudy A. Skin cancers after organ transplantation. N Engl J Med. 2003;348:1681-91. 11. Crowley JJ, Nikko A, Varghese A, Hoppe RT, Kim YH. Mycosis fungoides in young patients: clinical characteristics and outcome. J Am Acad Dermatol. 1998;38:696-701. 12. Lambroza E, Cohen SR, Phelps R, Lebwohl M, Braverman IM, DiCostanzo D. Hypopigmented variant of mycosis fungoides: demography, histopathology, and treatment of seven cases. J Am Acad Dermatol. 1995;32:987-93. 13. Leyva M, Rodríguez S, Carahyua D. Micosis fungoide hipopigmentada. Dermatol Peru. 2005;15:233-6. 14. Molgó M, Mora C, González S, Uribe P. Micosis fungoide hipopigmentada: a propósito de un caso. Dermatol Pediatr Lat. 2007;5:47-9. 15. Hsiao PF, Hsiao CH, Tsai TF, Jee SH. Minimal residual disease in hypopigmented mycosis fungoides. J Am Acad Dermatol. 2006;54:198-201. 16. Ardigó M, Borroni G, Muscardin L, Kerl H, Cerroni L. Hypopigmented mycosis fungoides in caucasian patients: a clinicopathologic study of 7 cases. J Am Acad Dermatol. 2003;49:264-70. 17. Tsianakas A, Kienast AK, Hoeger PH. Infantile-onset cutaneous T-cell lymphoma. Br J Dermatol. 2008;159:1338-41. 18. Garzón MC. Cutaneous T cell lymphoma in children. Semin Cutan Med Surg. 1999;18:226-32. 19. Beirana PA, Gutiérrez OT, Domínguez GA, Navarrette FG, Ramos GJ. Micosis fungoide en edad pediátrica. Rev Cent Dermatol Pascua. 2006;15:149-57. 20. Cuchía H, Salamanca A, Castellanos H. Micosis fungoide en estadío tumoral en un niño. Rev Asoc Colomb Dermatol. 2008;16:310-2. 21. Howard MS, Smoller BR. Mycosis fungoides: classic disease and variant presentations. Semin Cutan Med Surg. 2000;19:91-9. 23. Keehn CA, Belongie IP, Shistik G, Fenske NA, Glass LF. The diagnosis, staging, and treatment options for mycosis fungoides. Cancer Control. 2007;14:102-11. 24. Steinhoff M, Beyer M, Roewert-Huber J, Lukowsky A, Assaf C, Sterry W. Complete clinical remission of tumourstage mycosis fungoides after acute extensive skin necroses, granulomatous reaction, and fever under treatment with bexarotene, vorinostat, and high-dose fenofibrate. J Am Acad Dermatol. 2008;58:88-91. 25. Stein M, Farrar N, Jones GW, Wilson LD, Fox L, Wong RK, et al. Central neurologic involvement in mycosis fungoides: ten cases, actuarial risk assessment, and predictive factors. Cancer J. 2006;12:55-62. 26. Das JK, Gangopadhyay AK. Mycosis fungoides with unusual vitiligo-like presentation. Indian J Dermatol Venereol Leprol. 2004;70:304-6. 27. Krol A, Krafchik B. The differential diagnosis of atopic dermatitis in childhood. Dermatol Ther. 2006;19:73-82. 28. Ball E, Martin R. Micosis Fungoides estudio clínico prospectivo en una cohorte de pacientes venezolanos. Dermatología Venezolana. 2007;45:4-14. 29. Saettone A, Bravo F. Micosis Fungoide en un adulto joven. Dermatología Perú. 1997;7:123-7. 30. Liu V, Cutler CS, Young AZ. 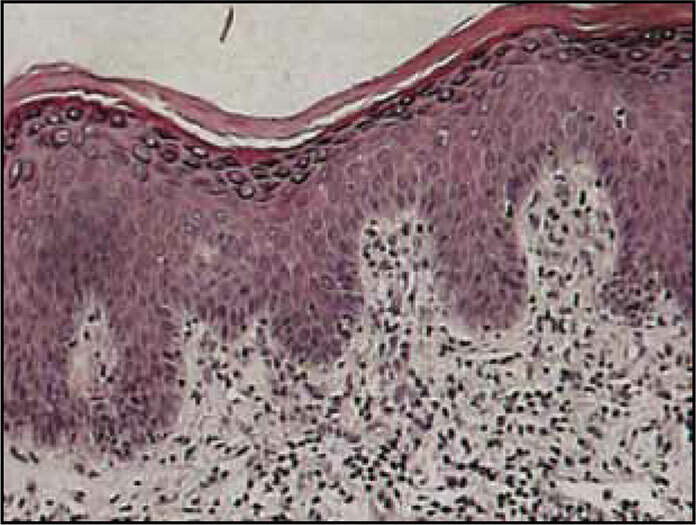 Case 38-2007: A 44-year old woman with generalized, painful, ulcerated skin lesions. N Eng J Med. 2007;357:2496-505. 31. Pimpinelli N, Olsen EA, Santucci M, Vonderheid E, Haeffner AC, Stevens S, et al. International Society for Cutaneous Lymphoma. Defining early mycosis fungoides. J Am Acad Dermatol. 2005;53:1053-63. 32. Yeh YA, Hudson AR, Prieto VG, Shea CR, Smoller BR. Reassessment of lymphocytic atypia in the diagnosis of mycosis fungoides. Mod Pathol. 2001;14:285-8. 33. Vieites PQ, Suárez PJ. Linfomas cutáneos de células T, revisión de los aspectos histopatológicos más relevantes. Rev Esp Pat. 2004;37:181-94. 34. Hodak E, David M, Maron L, Aviram A, Kaganovsky E, Feinmesser M. CD4/CD8 double-negative epidermotropic cutaneous T-cell lymphoma: an immunohistochemical variant of mycosis fungoides. J Am Acad Dermatol. 2006;55:276-84. 35. Bagot M, Boumsell L, Bensussan A. Immunopathogenesis of cutaneous T-Cell lymphomas. Hematol Oncol Clin North Am. 2003;17:1313-7. 36. Wain EM, Orchard GE, Mayou S, Atherton DJ, Misch KJ, Russell-Jones R. Mycosis fungoides with a CD56+ immunophenotype. J Am Acad Dermatol. 2005;53:158-63. 37. Singh ZN, Tretiakova MS, Shea CR, Petronic-Rosic VM. Decreased CD117 expression in hypopigmented mycosis fungoides correlates with hypomelanosis: lessons learned from vitiligo. Mod Pathol. 2006;19:1255-60. 38. El-Shabrawi-Caelen L, Cerroni L, Medeiros LJ, McCalmont TH. Hypopigmented mycosis fungoides: frequent expression of a CD8+ T-cell phenotype. Am J Surg Pathol. 2002;26:450-7. 39. Ben-Amitai D, Michael D, Feinmesser M, Hodak E. Juvenile mycosis fungoides diagnosed before 18 years of age. Acta Derm Venereol. 2003;83:451-6. 40. Neuhaus IM, Ramos-Caro FA, Hassanein AM. Hypopigmented mycosis fungoides in childhood and adolescence. Pediatr Dermatol. 2000;17:403-6. 41. Thurber SE, Zhang B, Kim YH, Schrijver I, Zehnder J, Kohler S. T-cell clonality analysis in biopsy specimens from two different skin sites shows high specificity in the diagnosis of patients with suggested mycosis fungoides. J Am Acad Dermatol. 2007;57:782-90. 42. Kim ST, Sim HS, Jeon YS, Lee JW, Rho HS, Choi SY, et al. Clinico-patological features and T-cell receptor gene rearranged finding of mycosis fungoides in patients younger than age 20 years. J Dermatol. 2009;36:392-402. 43. Rueda X, Cortés C. Linfomas cutáneos. Rev Asoc Colomb Dermatol. 2008;16:143-58. 44. Valle LE, Laffargue JA, Sarmiento FG, Suárez ME. Actualización de linfomas cutáneos primarios. Revista de la Asociación Médica Argentina. 2008;121:28-40. 45. Magro CM, Crowson AN, Morrison C, Li J. Pityriasis lichenoides chronica: stratification by molecular and phenotypic profile. Hum Pathol. 2007;38:479-90. 46. Rodríguez AM, Guzmán VO. Micosis fungoide: comunicación de un caso. Rev Cent Dermat Pascua. 2004;13:95-8. 47. Wain EM, Orchard GE, Whittaker SJ, Spittle MF, RussellJones R. Outcome in 34 patients with juvenile-onset mycosis fungoides: a clinical, immunophenotypic, and molecular study. Cancer. 2003;98:2282-90. 48. Prince HM, Whittaker S, Hoppe RT. How I treat mycosis fungoides and Sèzary Syndrome. Blood. 2009;114:4337-53. 49. Mann B, Jhonson J, Cohen MH, Justice R, Pazdur R. FDA approval summary: vorinostat for treatment of advanced primary cutaneous T-cell lymphoma. Oncologist. 2007;12:1247-52.